As usual, constant reader, you are tasked with deciding the outcome of this pugilistic endeavor by way of comment. On the last edition of Friday Night Fights, the battle of knights vs demons ended with a score of of 3-1 for Moko’s Knight Gundam. Tune in next week for another action packed edition of Friday Night Fights! Smaug and Laketown are cool indeed, but I’m gonna have to vote for the Skrill. That purple, black, and electric-blue color scheme is awesome (not to mention the How to Train Your Dragon reference. I love that movie.). Skrill Showdown gets my vote. Blue has better dragons, but I like red’s overall scene better. I vote red. And while I think it’s great that you are blogging for TBB now Simon, FNF just isn’t the same without Keith. Smaug…..color combination very striking and cool dragon. The hovering dragon in Skrill Showdown is very cool, but I’ll go with Smaug the Stupendous by a nose because I just really like Smaug’s form and positioning. Both are awesome. I’ll go with Skrill Showdown: The sense of action in it is superb. The water surging around the rocks is so well done, you can almost feel the ocean spray, hear the rushing wind. Smaug the Stupendous. 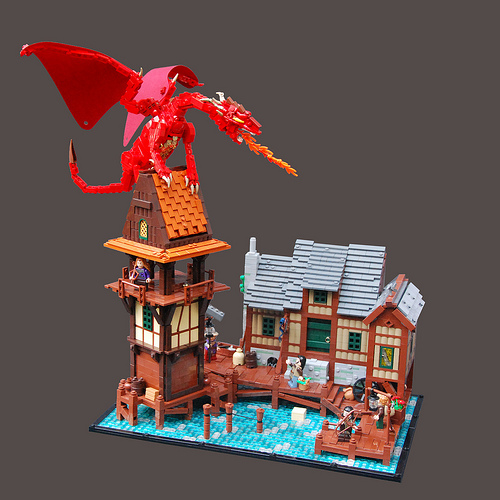 The Laketown Village is perfect, an I especially like the roofing. On the basis that Smaug is a little too small (I know, I’m nitpicking), I’m going with Stormbringer. Both are excellent though. Ooh, tough round. 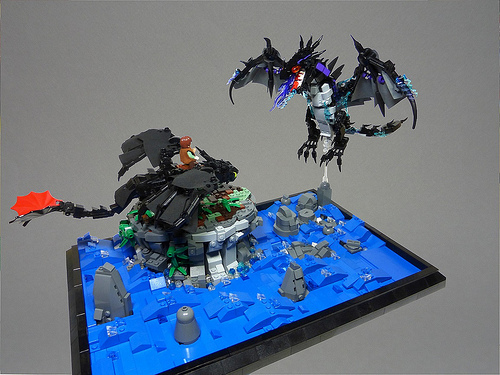 Both build are amazing, and both dragons are awesome, but since I can only pick one, I think that I am going to have to go with “Skrill Showdown”, for it’s stupendous dragon designs! I think Jonas had a better build, but Stormbringer’s dragons put it over the top for me. Stormbringer gets my vote! Another fantastic round TBB, looking forward to the next one! I’ll go with Smaug and Lake Town.